Now I'm not just fighting the zombies. I'm fighting to save the life I've grown to love. Through The Zombie Glass starts back up pretty much where Alice In Zombieland ended. Ali is still "recovering" (Cole's word) from the wound she sustained during the last zombie battle at the hands of Cole. Cole is acting all broody and moody because he feels bad for almost killing her. He also is driving Ali crazy with his overprotective attitude saying that she can't train, kiss, or get out of bed because of her injury. *I swear, Men! * We also find out that since Ali's injury her and Cole, for reasons unknown, haven't been having any visions. 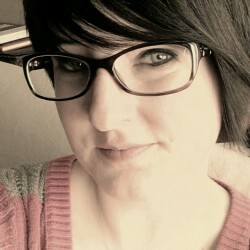 Ali believes this may be because Cole feels so guilty about her near death experience that he is putting emotional walls up, effectively blocking the visions. At the end of AiZ we lost a couple of slayers opening up some spots that needed to be filled. Enter Gavin and Veronica, slayers Cole knew from Georgia. In walks Gavin and BAM visions are back, but between Ali and Gavin. Lets just say that's bad news bears. Justin also makes a reappearance that we aren't sure how to feel about. Personally, I hate him. Not far into the book Ali gets attacked. Afterwords she has a surprising development that leaves me panicking about her future. It doesn't help that the summary of the book indicates all sorts of bad things happening. But try not to get ahead of yourself while you're reading, you'll make yourself have a panic attack. Ater this new discovery all sorts of drama happens causing me to seriously hate Cole, did I mention that him and Veronica have a past? Yeah. All this and it's only halfway through the book. So after tons of action and drama AND a kidnapping the book comes to an end. That's all I will say about the end because if I say anything else it will be spoilerific. Long story short I LOVED this book. Gena did not disappoint, there was action and suspense with every page turn. You are constantly wondering about everyone's motives and dying to know how things are going to end. My only wish is that all of the books were out RIGHT NOW. But what can ya do? 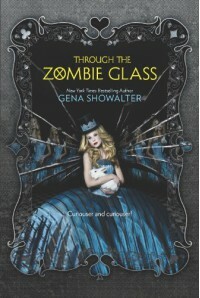 If you're on the fence about whether or not to start this journey, stop thinking about it and go get Alice In Zombieland and Through The Zombie Glass by Gena Showalter NOW!